Claimed weight of the ME7 is 375g. Price is $200. 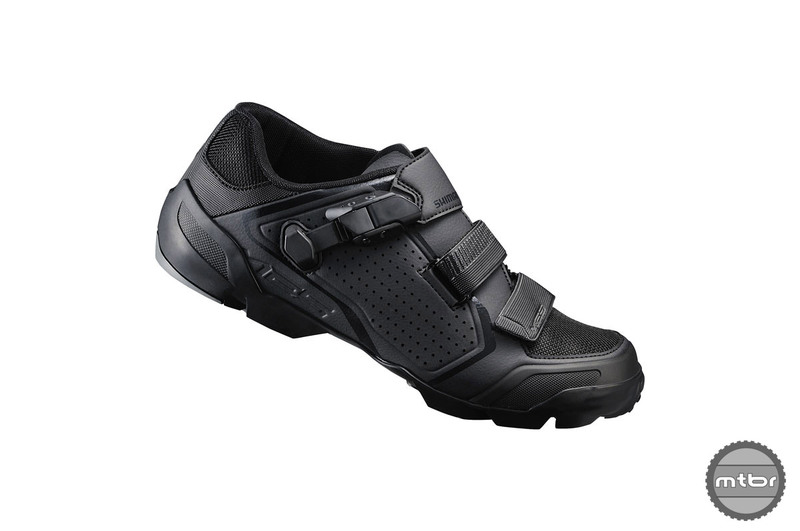 Shimano may be best known for its drivetrain components, but the Japanese giant also does a ton of soft goods, including some very capable mountain bike shoes. Today, that line-up expands with two new enduro-specific models, plus a lightweight XC pedal masher. 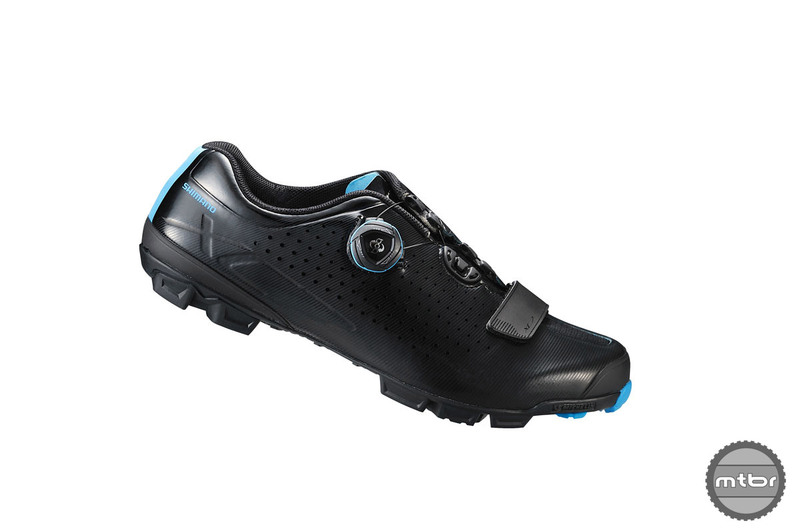 All the new footwear is built on the Shimano Pedaling Dynamics (or SPD) platform, which Shimano says is designed to be used with their pedals, and is engineered together as a complete system, optimizing bio-mechanics. That’s at least in part a cheeky way to convince people to buy Shimano pedals, but our XT SPDs are the best crank spinner we’ve ever owned, so we’ll give them a pass. 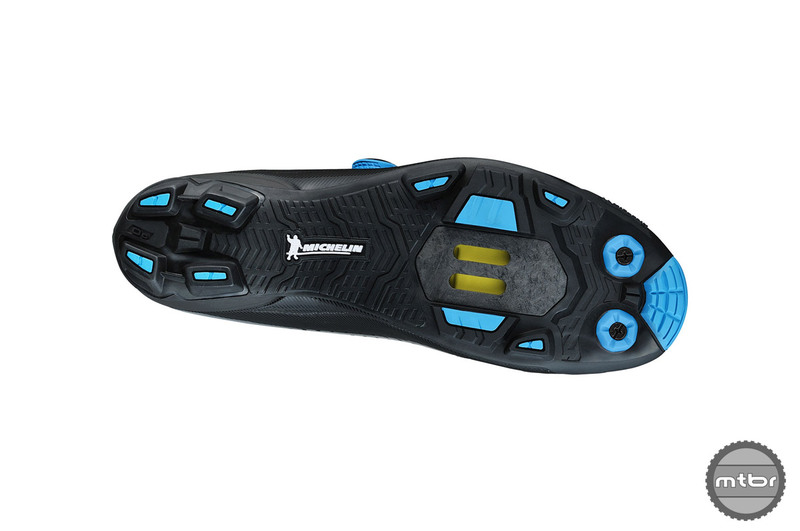 Shimano’s torsional balance sole technology is designed to improve balance and bike control by allowing for some lateral movement in the heel, while optimizing pedaling efficiency at the sole/cleat interface. For the new 2017 shoes, Shimano collaborated with Michelin on sole tread and Boa on the closure system. The new Mountain Enduro series is designed for aggressive trail performance, combining the light weight and solid pedaling performance, with durability, grip and armored protection. 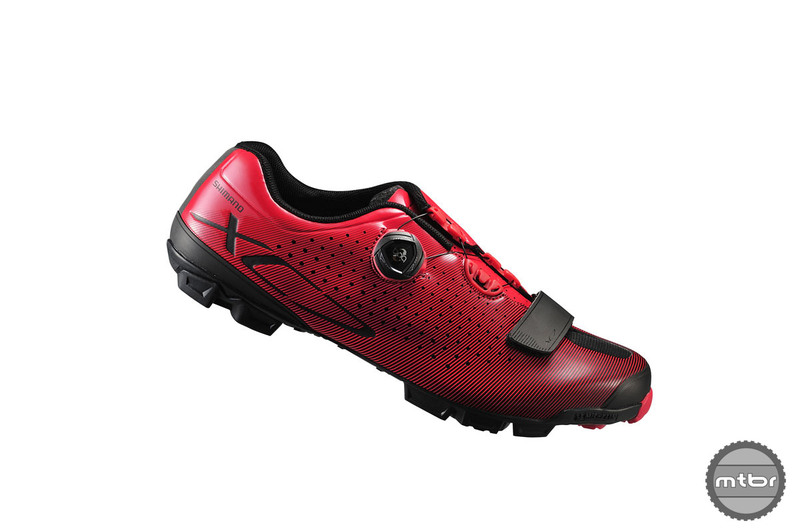 Comprised of two new models (ME7 and ME5) the ME series features Shimano’s TORBAL (or torsional balance) sole technology, which is designed to improve balance and bike control by allowing for some lateral movement in the heel, while optimizing pedaling efficiency at the sole/cleat interface. 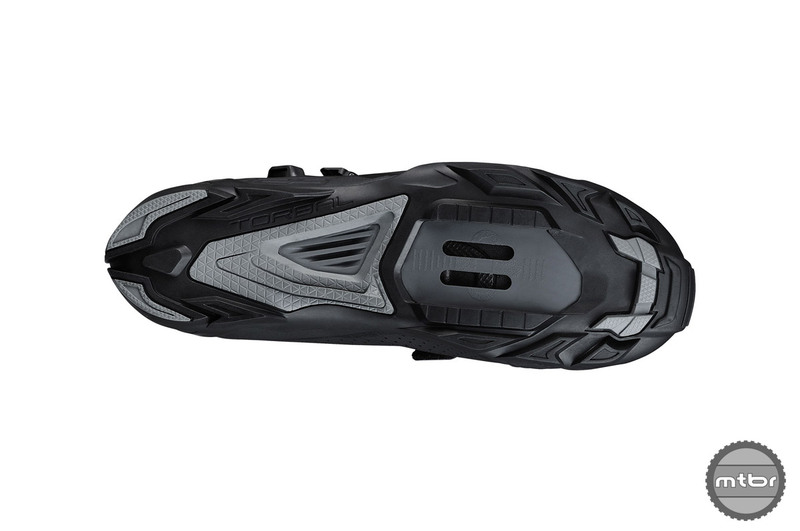 Added impact protection in the toe, upper and ankle, as well as a reverse mount buckle design for improved durability, the ME7 and ME5 look to be well suited for the rigors of enduro racing — or just smashing around your local trails for fun. Claimed weight of the ME7 is 375g. Price is $200. The ME5 comes in at 385 grams and runs $150. Shimano collaborated with Michelin on sole tread and Boa on the closure system. The ME7 features an outsole design created in collaboration with Michelin. Using dual-density rubber and a strategic lug placement pattern, the design draws upon Michelin’s knowledge of tread design to improve grip off the bike without compromising pedaling efficiency. 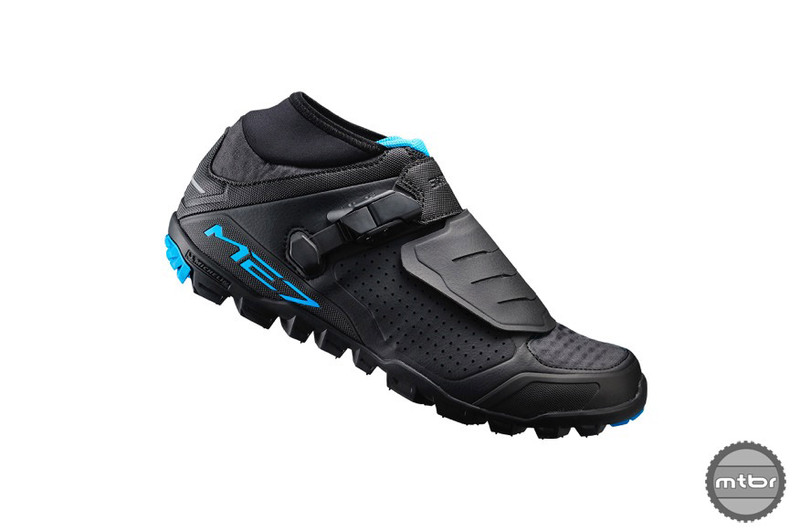 Further advancing rider protection and comfort, a new stretch Neoprene ankle collar keeps out trail debris while ample mesh ventilation throughout the front and rear of the shoe improves ventilation. The speed lacing system adapts to a wide range of foot shapes and is kept protected from the elements by an armored lace shield. The new XC7’s Boa IP1 dials allows a tunable fit and the Boa Powerzone wire guide is adjustable to help maintain consistent tension along the top of the foot. Meanwhile, the XC series is designed for cross-country and cyclocross performance. Utilizing a rigid, lightweight carbon fiber reinforced midsole and a supple high-density synthetic leather upper, the new XC7 is meant to be efficient and comfortable. The Boa IP1 dials allow a tunable fit and the Boa Powerzone wire guide is adjustable to help maintain consistent tension along the top of the foot. The full-length dual-density rubber construction increases grip and durability and the tread pattern is specifically designed for mud-shedding. The XC7 also features an outsole designed in collaboration with Michelin. The full-length dual-density rubber construction increases grip and durability and the tread pattern is specifically designed for mud-shedding, helping to maintain lightweight performance even in adverse conditions. Claimed weight is 315 grams. Price is $200. For more info visit www.shimano-lifestylegear.com. Utilizing a rigid, lightweight carbon fiber reinforced midsole and a supple high-density synthetic leather upper, the new XC7 is meant to be efficient and comfortable. An avid cyclist, Jason Sumner has been writing about two-wheeled pursuits of all kinds since 1999. He’s covered the Olympics, Tour de France, MTB world champs, and dozens of other international cycling events. He also likes to throw himself into the fray, penning first-person accounts of cycling adventures all over the globe. Sumner, who joined the Mtbr staff in 2013, has also done extensive gear testing and is the author of the cycling guide book "75 Classic Rides: Colorado." When not writing or riding, the native Coloradoan can be found enjoying life with his wife Lisa and kids Cora and Tommy in and around their home in the MTB Mecca of Crested Butte.